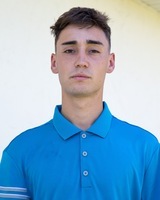 Eastern Florida State College men's golfers Ryan Rozic and Fraser Davren from Glasgow have been named semi-finalists for the NJCAA Jack Nicklaus National Player of the Year award presented by Barbasol. in February and finished sixth in two other spring events this season. Davren led the Titans to a second-place finish in the District 4 Championship last week, placing in a tie for fourth with a score of 218 over the three rounds. Davren and Rozic join 28 other NJCAA golfers who were recognised for the Nicklaus Award. Finalists will be selected and announced on May 14 with the Nicklaus Award recipient will be announced May 31 at a ceremony during the final round of the Memorial Tournament presented by Nationwide at Muirfield Village Golf Club. It is the third straight season a member of the Titans has been named a semi-finalist for the prestigious award. Former Titan Kerry Sweeney won the Nicklaus Award in both 2015 and 2016.